Here's the simple stripes quilt I spent most of my time working on this past week. Our friends Sara and Ryan are having a baby boy in April, and their baby shower was this past Saturday. Of course I waited until six days before the shower to start making their gift! Why I procrastinate so much, I'll never understand. 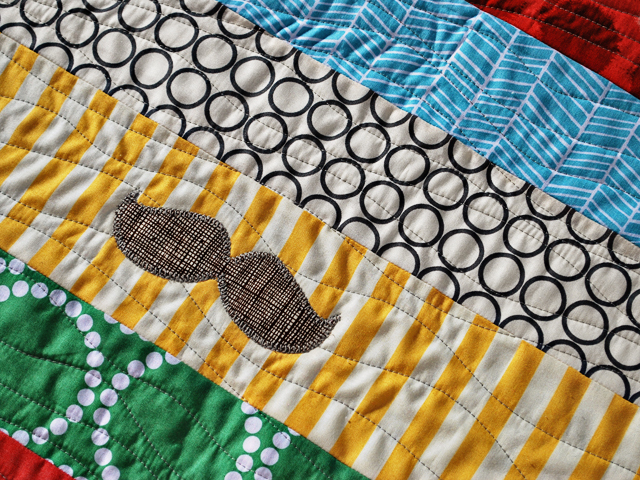 Yes, this quilt has a mustache on it! My husband made me do it. When I told him I was making a quilt for them, he asked if I could add a mustache to the quilt. This new baby boy has a grandpa that is known for his mustache. The baby shower even had a mustache theme, so this fit in quite well! 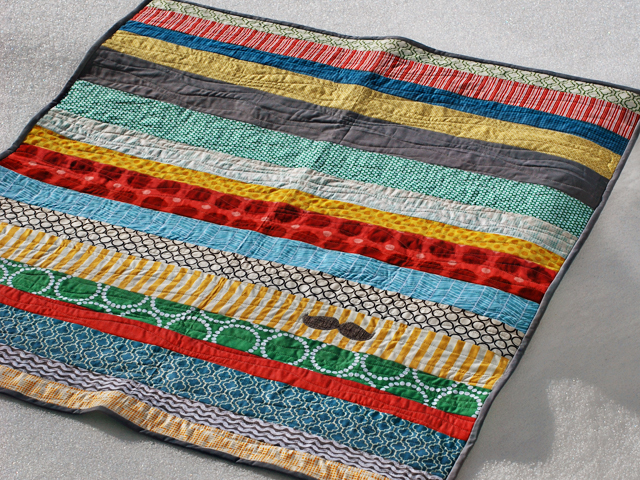 I used lots of basic yellows, grays, blues, reds, and greens in this quilt that were slightly desaturated. The backing is a Denise Schmidt print from JoAnns. I bound it in some Kona Medium Gray. I quilted it with wavy lines (my new favorite!) in a light gray thread. 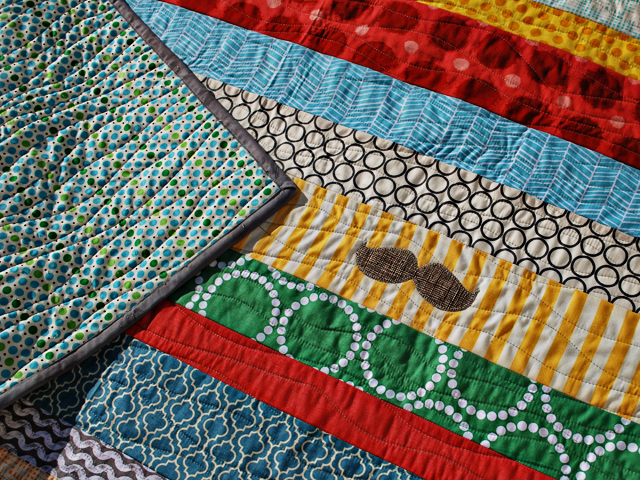 The wavy line quilting is so fast and gives this quilt a little bit of texture. I appliqued the mustache on after the quilting was finished. So there's my first finish of February! It definitely won't be the last. Looks great. The moustache is the perfect touch. Great quilt for a little guy. This is so fun! Love, love, love it. Oh, what a great quilt, love the moustache, just perfect. The mustache is such a great touch! I love it. And I love the wavy quilting too. Very cute idea to add the mustache. Great job! i love this quilt! holly is so talented! 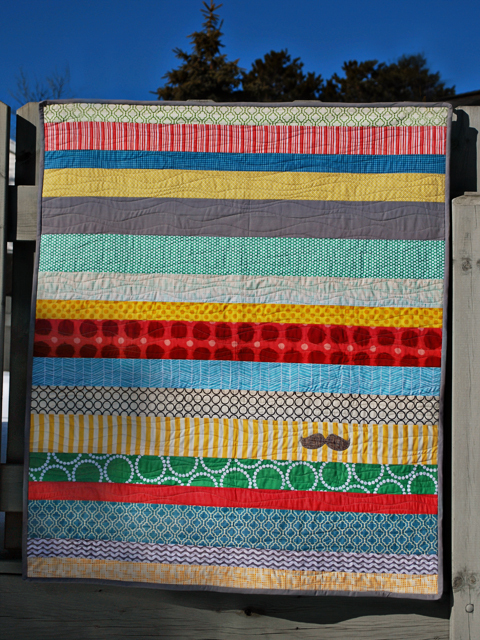 her quilting is so great and it gives the quilt such movement! Love the way it's quilted. The mustache is too much- I just love it. I love that mustache on it. Too cute! Your curvy quilting lines are exactly right for the strips. Simple but effective. Love the choice of bright colours. Would you like some Fly A Kite?? A Joyful Soul Fabrics giveaway!! !